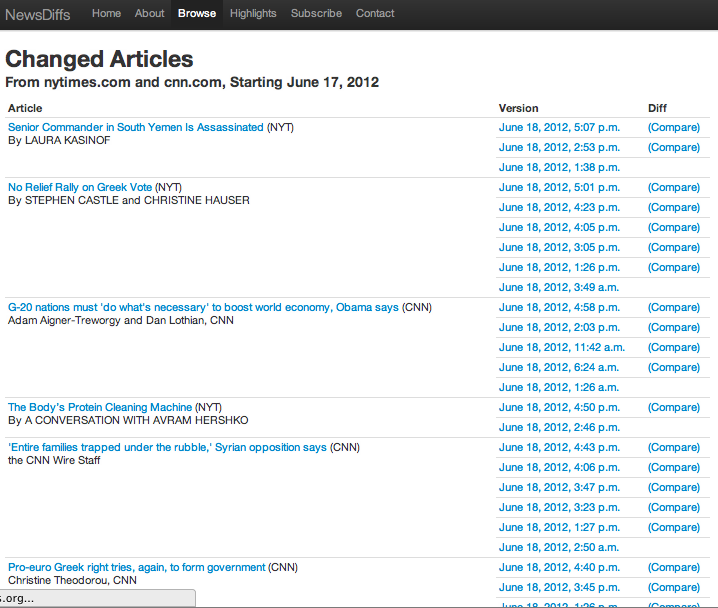 NewsDiffs archives changes in articles after publication. Currently, we track nytimes.com, cnn.com, politico.com, washingtonpost.com, and bbc.co.uk. NewsDiffs, which was born out of the Knight Mozilla MIT hackathon in June 2012, is trying to solve the problem of archiving news in the constantly evolving world of online journalism. It was recently added to the thousand sites archived by the Library of Congress. The changes which have drawn the most attention are the addition of "on this issue" to a New York Times editorial about Obama after the PRISM disclosures, and the disappearance of beef stroganoff from the obituary of a rocket scientist. You can browse our repository of articles. Or you can take a look at some of the examples of articles that have changed. If you are a developer, you can check out the Github repository. If you want updates, you can subscribe to our newsletter, or you can follow NewsDiffs on Twitter.